There are situations where you write a post or page but only want specific readers to read that post or page. For example, the post might contain student work or photos that you only want to share with the family, students or other teachers. One option is to password protect the post or page; any user that has the password can view the protected post or protected page. 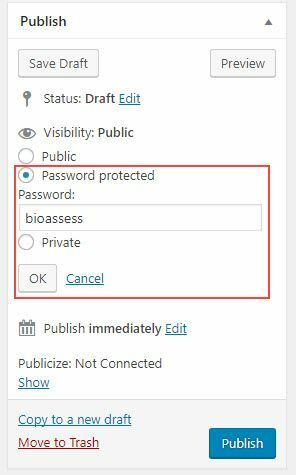 If you want to make the entire blog to be private, only visible to specific readers, you need to do via Settings > Reading. Learn more about making your entire blog private here. 3. Once post or page is written click Publish. 4. The post or page is now password protected. The password for password protected posts is stored as an encrypted cookie in the web browser for 10 days once it has been entered the first time in a web browser.